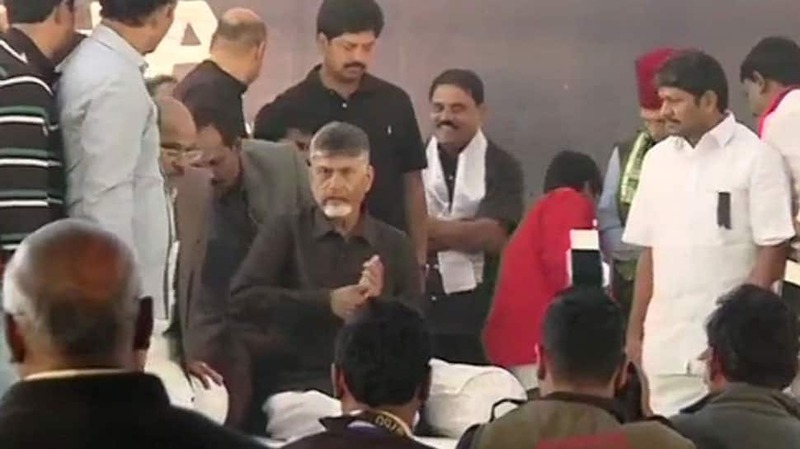 NEW DELHI: Andhra Pradesh Chief Minister and Telugu Desam Party (TDP) chief N Chandrababu Naidu on Monday began his day-long fast at the Andhra Bhawan on Monday demanding special status for his state. Ahead of that, TDP chief paid tribute to Mahatma Gandhi at Rajghat. Naidu arrived at the Rajghat along with TDP MPs and party workers and then proceeded to the Andhra Bhawan to observe a day-long fast there. The TDP chief had arrived in the national capital on Sunday evening. According to reports, Naidu will stage the ‘Dharma Porata Deeksha’ (a day-long protest for justice) at the Andhra Pradesh Bhavan in the national capital from 8 AM to 8 PM. The Andhra Pradesh Chief Minister will sit on a hunger strike along with his ministers, party MLAs, MLCs, and MPs. As per an official statement, Naidu will also submit a memorandum to President Ram Nath Kovind on Tuesday. Shortly after arriving in the national capital, the Andhra Pradesh Chief Minister dubbed Prime Minister Narendra Modi as a “bad ruler”. “When Prime Minister comes to a state, it is basic etiquette to consult the Chief Minister of that state, mention his name in invitations. But your tour exposed your bad culture and bad manners of ill-treating the regional leader. And you speaking of culture and manners is the finishing touch,” Naidu added. Earlier in October 2013, Naidu had staged an indefinite fast at the Andhra Pradesh Bhavan demanding that if a separate state is carved out of the then unified Andhra Pradesh, both should get equal rights. On the fifth day of his protest, Naidu was forcibly shifted to Ram Manohar Lohia Hospital. Later, on his birthday on April 20, 2018, the TDP chief had observed fast in Vijayawada demanding special status for the state. Naidu’s Telugu Desam Party had pulled out of the BJP-led NDA last year over the Centre’s refusal to grant special category status to Andhra Pradesh. On Sunday, Prime Minister Narendra Modi launched a scathing attack on Naidu, calling him a political opportunist and a master in backstabbing and destroying the dreams of people.